Lake Maracaibo is the top hotspot, averaging over 232 flashes / km2 / year. Lake Maracaibo: The world's top lightning hotspot is over Lake Maracaibo in northwestern Venezuela. Here, nocturnal thunderstorms occur on average about 297 days per year and produce an average of about 232 lightning flashes / square kilometer / year. Local people have called this phenomenon "Relámpago del Catatumbo" (Catatumbo lightning) for hundreds of years. Image by NASA. Enlarge image. 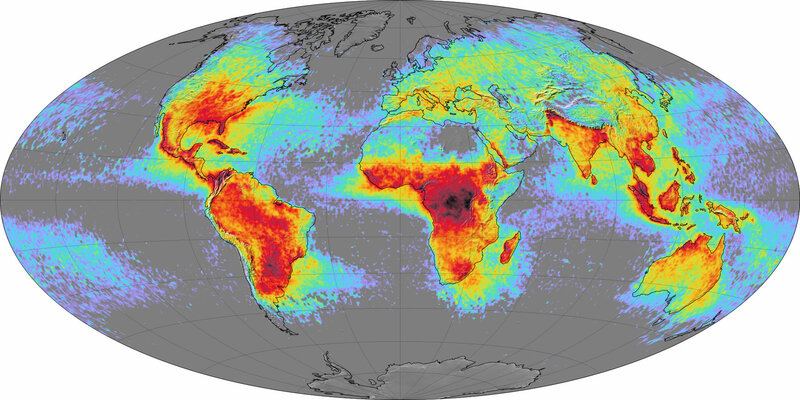 Some of the early data from the satellite was used to create global maps of lightning activity. These maps revealed that the geographic distribution of lightning is not uniform across the Earth. It is generally highest in the tropics and decreased with distance north and south of the equator. However, some regions and even small areas have exceptional amounts of lightning. 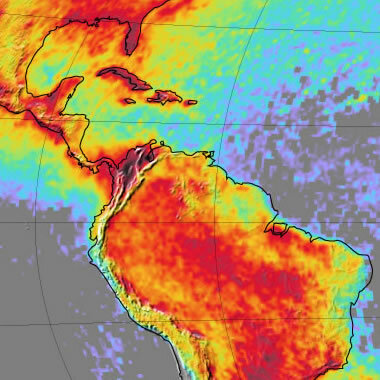 One small area in northern South America is clearly the world's principal lightning hotspot. That hotspot is located over the southern end of Lake Maracaibo, a brackish bay in northwestern Venezuela. This area has a lightning flash rate density of 232.52. That means that the area experiences an average of 232.52 flashes of lightning per square kilometer per year. To illustrate how the Lake Maracaibo hotspot is in a class of its own, the second and third place hotspots had flash rate densities of 205.31 (Kabare, Democratic Republic of the Congo) and 176.71 (Kampene, Democratic Republic of the Congo). They do not come close to rivaling its lightning activity. In addition to Venezuela and Democratic Republic of the Congo, locations in Colombia, Pakistan, and Cameroon are in the world's top ten lightning hotspots. A table listing the world's top ten hotspots accompanies this article. Lake Maracaibo is the largest lake in South America, with a surface area of 13,210 square kilometers. It is located in northwestern Venezuela about ten degrees north of the equator. The lightning hotspot is centered on the south end of the lake, where nocturnal thunderstorms produce lightning an average of about 297 nights per year. This map was created by Norman Einstein and is used here under a GNU Free Document License. Earth's New Lightning Capital Revealed. Ryan Connelly. Published on the NASA website, May 2016. Where are the lightning hotspots on Earth? Rachel I. Albrecht, Steven J. Goodman, Dennis E. Buechler, Richard J. Blakeslee, and Hugh J. Christian. Bulletin of the American Meteorological Society. In press, early online release accessed May, 2016. DOI: http://dx.doi.org/10.1175/BAMS-D-14-00193.1. 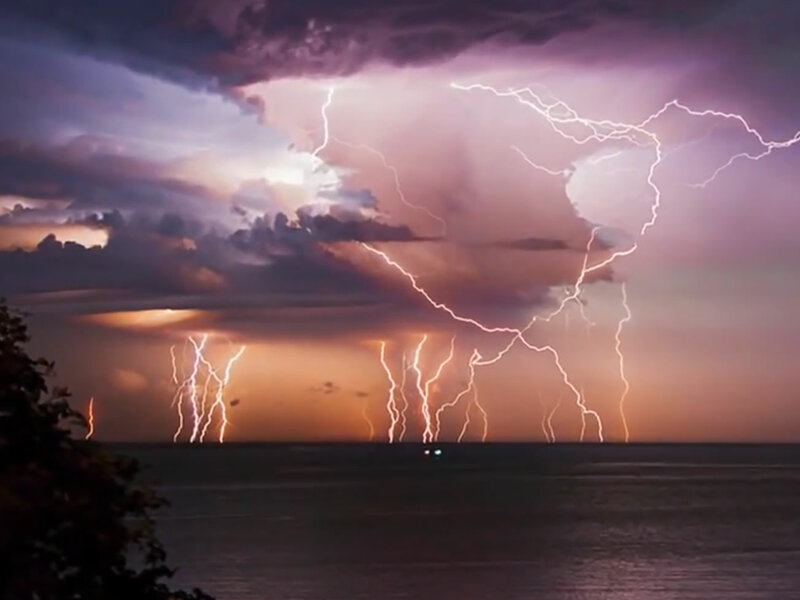 Lake Maracaibo has a reputation for its lightning that dates back before the start of written history. Local people call this phenomenon "Relámpago del Catatumbo" (Catatumbo lightning). It is named after the Catatumbo River, which enters Lake Maracaibo on its southern shore. The lightning is centered above the mouth of the river. Sailors call the lightning "Faro de Maracaibo" or "The Beacon of Maracaibo" because, like a lighthouse, the flashes can be clearly seen from the Gulf of Venezuela and on some clear nights, out into the Caribbean. The epic poem, "La Dragonetea" tells the story of how, in 1595, ships under the command of Sir Francis Drake attempted a night surprise attack on the Spanish colonial city of Maracaibo. A night watchman in the city noticed silhouettes of Drake's ships illuminated by the lightning and notified the Spanish garrison stationed in the city, and with that advance warning, they were able to foil the attack. The lightning is such a source of local pride that Zulia, one of Venezuela's 23 states, boasts about the Relámpago del Catatumbo by displaying lightning bolts on its flag and coat of arms. Topography and Lightning: The Lake Maracaibo basin is located between the most northern ridges of the Andes Mountain Range. This topographic configuration contributes to the abundant lightning over the lake. Image by NASA. Enlarge image. Lake Maracaibo is the largest lake in South America, with a surface area of 13,210 square kilometers. It is surrounded by mountains on three sides. The waters are very warm throughout the year, normally between 28 and 31 degrees Celsius (82 to 88 degrees Fahrenheit). This makes the lake a ready source of heat and humidity to drive convection. Through the day, the lake and the surrounding hills are heated by the sun. The hills warm faster than the lake, and divergent winds move across the surface of the lake towards the land. Then at night, the land cools faster than the lake, and winds reverse to converge across the surface of the lake. This pattern causes nocturnal convection above the lake and produces recurrent thunder and lightning above the lake.